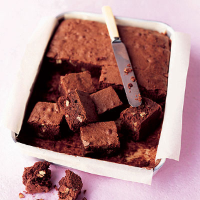 These dense, chewy brownies will keep for a couple of weeks if you wrap each brownie well in clingfilm - but do you think you'll be able to resist them for that long? Preheat the oven to 180°C, gas mark 4. Grease a 23cm x 32cm deep-sided baking tray and line with baking parchment. In a small saucepan, melt the butter and chocolate slowly, stirring regularly. When the lumps of chocolate are fairly small, turn off the heat - there will be enough heat to finish melting the chocolate and you reduce the risk of overheating the mixture. Allow to cool. Roughly chop the pecan nuts and set aside. In a large bowl, whisk together the eggs, sugar and vanilla essence for 10 minutes or until pale and fluffy. Stir the chocolate mixture into the egg mixture, then fold in the flour and pecans. Pour the mixture into the prepared baking tray and bake for 25-30 minutes. Test with a skewer. The mixture should seem not quite cooked in the very middle. Allow to cool, then cut into 16 squares to serve.